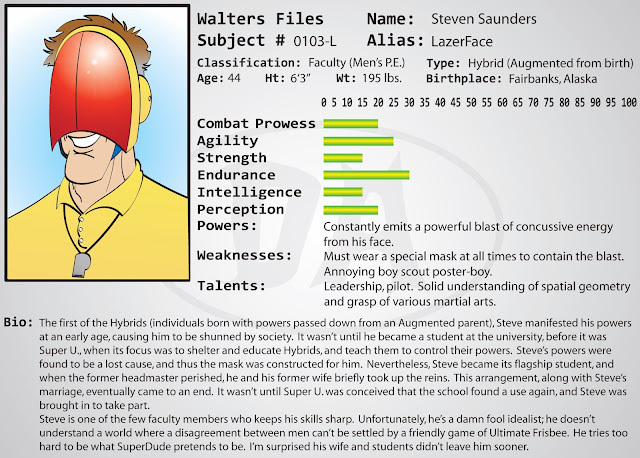 You might think LazerFace is a parody of Cyclops, and you'd be right, but personality-wise I get my inspiration for him from one of my highschool gym teachers. Dude looked just like Ric Flair. In tiny shorts. I've been putting LazerFace's file off because Jason (who I let run wild with the backgrounds of the faculty members in the Saturday Super Stories) and I had some conflicts of interest, particularly concerning the school before it was Super U. But I think I've managed to stay vague enough in this file where I'm not stepping on too many of his toes. Regardless, if you're following the comic and you're reading the SSS, you'll probably see things conflict now and then. This is totally alright. I don't want to limit Jason, and I don't want him to limit me. Just pretend one is, like, a fanfic of the other. But with that, I'm damn near out of Walters Files! There's one more student, and one more teacher (whom I haven't even used in the comic yet), and that's it! Once I rearrange the site, I may make a new section for Walters Files of miscellanous characters and villains, like Technosyde and King Carp and stuff. As for what happens when I'm all out of characters? I haven't figured that out, yet. Ideally, I'd like to go to doing three comics a week. But until this comic gets off the ground, that just might not be reasonable.